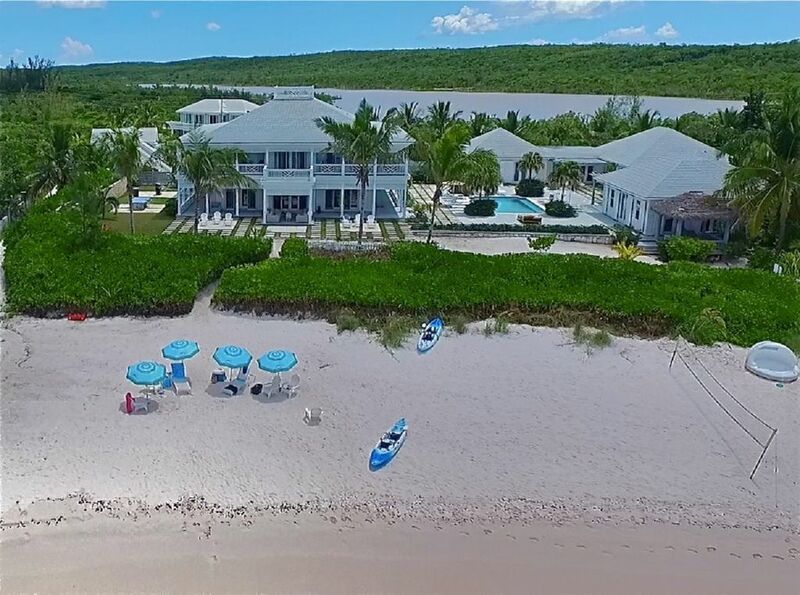 Lush Life is the best house on the best beach in the best town on Eleuthera. It is the most popular vacation rental on the island, a property with an ideal layout for multiple families, reunions, and small weddings. This luxurious beachfront compound is located directly on the pristine, pink-sand French Leave Beach, which has been ranked among the top 20 beaches of the world. There are just a few other houses on this mile-long beach. It's usually deserted. The water here is famously calm, with a perfect sandy bottom and spectacular snorkeling just offshore. Lush Life was the setting for the Tyler Perry/Janet Jackson film, ''Why Did I Get Married Too'', which was shot on location in the house and on its beach, pool, and grounds. Lush Life has a total of four structures with 9 bedrooms, 11 baths, 4 kitchens, beautifully landscaped grounds, and a large heated pool. Full maid service twice a week is included, as is a nearby caretaker. Other staff including a selection of cooks and chefs, are available upon request. The proximity of the compound to the water, accentuated by multiple seating areas on and almost on the beach, as well as a new, large “Sky Box” built over a dune, offer unparalleled opportunities to drink in the beauty of one of the most stunning beaches in the world. Situated in the prestigious Banks Road, where Governors Harbour’s great estates are located, Lush Life is less than a mile from Tippy's famous beachfront restaurant and bar, the new “1648” restaurant, Da Perk, Bacchus Fine Foods, and the historic town of Governor’s Harbour. The houses at Lush Life were exquisitely designed, and built to the most exacting modern standards of workmanship. They feature Brazilian hardwood floors, cypress cedar ceilings, custom tile, electronic mini-split air-conditioning systems, and decor by one of the Bahamas' premier interior designers. The home is continuously upgraded and maintained to the highest standards that an out island setting allows. The Main House: This magnificent Bahamian Colonial mansion has 4 king bedrooms and 5 bathrooms, and sleeps 8. The large great room, hall, formal dining room, and expansive veranda look directly out upon French Leave Beach. The extraordinary kitchen would satisfy any master chef, and is designed to handle the largest dinner parties. It is equipped with two large refrigerators, giant freezer, gas range, and more. The Guest Cottage: This cottage has two king-bedroom suites, 3 baths, and a full kitchen. It overlooks the pool and has ocean views. Is connected to the Bunk Room and Studio Apartment. The Bunk Room: This structure, connected to the Guest Cottage on one side and the Studio Apartment on the other, consists of a large bedroom and private bathroom. The bedroom is furnished with 3 bunk beds and 3 trundle beds, sleeping up to 9 children. The Studio Apartment: This cozy cottage with views across the pool at the beach and ocean, is linked to the Bunk Room. It has a large living/bedroom area with a four-poster king bed, a kitchen, and a private bathroom. The Pool Cabana: This bright one-bedroom house is on the beach and beside the pool. It has a king bedroom, a large living room, and a full kitchen and bath. Lush Life comes with everything you need to enjoy your stay on Eleuthera including flat-screen satellite TVs with DVD players, high-speed internet with WIFI, desktop computer, free VOIP telephone line, books, and games, heated pool, gas grill, outdoor ping pong, kayak, and surf board. Beachfront location. Heated pool. Equipment includes kayak, surfboards, books and games. Housekeeping two days a week is included. House was beautiful. Tipa and Miller were so attentive to anything we needed. Beach was the best one we saw all week with the exception of Lighthouse. Would love to be able to rent this again. Our entire family of 25 stayed at Lush Life and had an awesome time. The beach is beautiful and very private. The accommodations are luxurious and the weather was perfect. Skip and Jackie helped to make it a very special vacation for all of us. I would highly recommend Eleuthera and Lush Life for family vacations. Lush Life exceeded my expectations! The staff were very friendly and attentive. We took 20 family and friends for a special occasion celebration and everyone loved the property and location. The beach was beautiful...a great place to walk every morning! We hired a personal chef for the week which made feeding that many people easy and affordable. Overall a great experience that I would highly recommend to others. 12 of us spent an amazing week at Lush Life.The house was just as the pictures depicted. Beautiful! Every room was spotless and offered its own amazing view. The grounds were very well kept. Tepa and Ricardo were always there to answer questions and to help with anything we needed. The house is in a great location- not far from town and plenty of restaurants. I look forward to visiting the Island again soon! This was our third stay at Lush Life. The compound is beautiful, the beach spectacular and Teppa is amazing. He took care of all our needs all week. Every day was beautiful and relaxing. It was wonderful to come back to this beautiful place. We had 15 people staying at the Lush Life for 10 days to celebrate my 50th birthday. The house and property are beautiful and well maintained. The beach is incredible and our only wish is that we could have spent more time there. Skip and his staff were great and we thoroughly enjoyed the house band so much we asked them back for a second night! It was an incredible vacation and we will definitely be back. Rates are for the first 12 guests. For each additional guest, add $500/week. Babies under 2 are free. Note: We set the rates this way to make the house more affordable for small groups who use less utilities and create less wear and tear.